Logan ties up loose ends in Dead Man Logan #6, by writer Ed Brisson, artist Mike Henderson, colorist Nolan Woodard, and letterer Cory Petit. This issue slows things down, putting an end to one chapter of this story and beginning the next, but it does it with the pitch-perfect characterization and art that is this book's stock in trade. Logan goes to Captain America and apologizes to him for his attack on the Avengers. 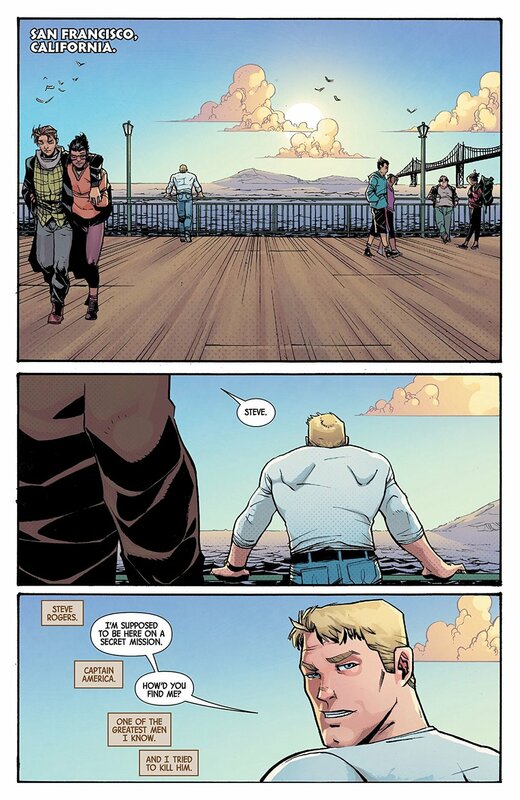 Cap accepts his apology and the two part as friends. Then, Logan finds the resurrected Marino Yashida and gives her a task to perform. He is met up with by a very familiar face, and the two share a talk and a bar fight. Finally, Logan says goodbye to Jubilee, Glob, Cecilia Reyes, and Hawkeye and heads back to the Badlands. Ed Brisson continues to kill it with this issue. He takes Logan tying up loose ends and makes it into an insightful, poignant, and ultimately fun comic. Each sequence in the book shows readers a little bit more about Logan as a man, as he deals with his own mistakes (the attack on the Avengers), takes care of someone he cares deeply about (the job he leaves for Mariko), and saying goodbye to his friends. It's the perfect send-off and puts everything into a neat bow, indeed beginning the end of Logan's journey. There's a rather large surprise guest star in the book, and it's played exactly the way it should be. It's both unexpected and yet has an air of inevitably about it. It's a fun sequence, not because it's funny, but because seeing these two together is sort of a fan's dream come true. It's not a long sequence, but it's just right and ends in a significant way. Mike Henderson's art continues to be perfect for this book. His style is very cartoony, but he has a grasp of character acting that really sets everything off. That's crucial to an issue like this, where there's no action and everything hinges on selling what's happening in the dialogue. Henderson does this with aplomb. Dead Man Logan #6 is a masterpiece. It combines deft characterization, great art, and fantastic story beats to create something that perfectly does its job. In the hands of another creative team, this could have been a glorified filler issue, but Brisson and Henderson give it the perfect amount of gravitas and fan service, making it truly special.